A mass shooting today, at Fort Hood. This was previously the site of another similar shooting years ago. The government entity that boasts of "keeping us safe" apparently can't even keep its own hapless minions safe, nor learn from past experience. Regulars to this blog know the drill by now: there is a reliable astrological formula for these events, involving Pallas (significator of ethics and libertarian non-aggression, or the lack thereof) and other factors. So here's the chart and the list of aspects fulfilling the formula. 1. Pallas ruled by the Sun which is square Pluto. 4. 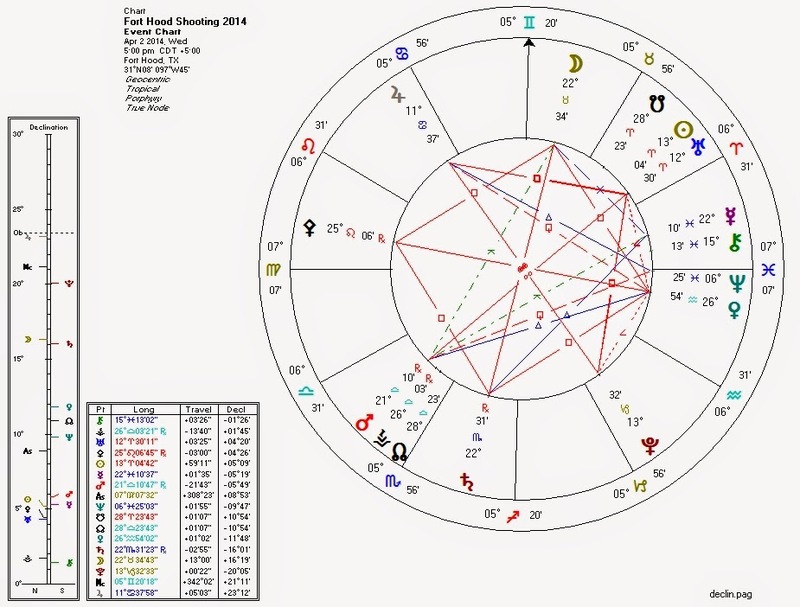 Pluto opposite Jupiter (ruler of the Fourth House). 6. (optional) Mercury in an angular house. Why do military bases and schools make such great targets for homicidal mass-shootings? Because they're "gun-free zones" in which potential victims are not allowed to be armed. Yes: military bases, in the infinite wisdom of our overlords, do not allow most soldiers to walk around with guns. astrolibertarianApril 10, 2014 at 4:26 AM http://pittsburgh.cbslocal.com/2014/04/09/multiple-students-reported-stabbed-at-franklin-regional-high-school/ Same configuration, with Venus septile rather than semisquare Pluto.